Put the apples and blackberries into a large, shallow over proof dish. Mix the water and sugar. It will be a thick. Drizzle over the fruit. Mix the butter into the flour until smooth, and then add oatmeal and brown sugar. Continue to rub the mixture together until it forms a crumble. 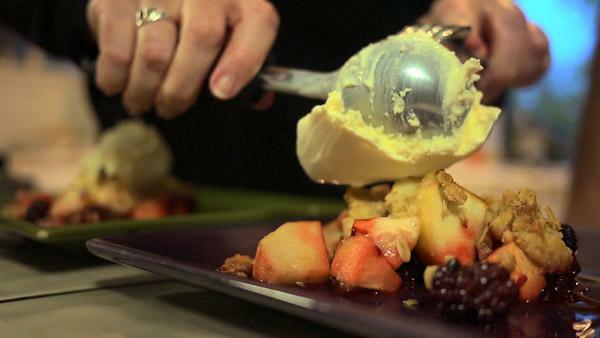 Crumble the topping over the fruit. Preheat the oven to 400 degrees. Bake the crumble for 15 minutes at 400 degrees. Reduce heat to 375 degrees and bake for 15 minutes more. Serve warm with ice cream or whipped cr�me.